I have a long cherished passion for vintage home management books and magazines. Indeed anything on this subject from the Victorian and Edwardian era up until the early 1970’s (when this subject fell out of favour in women’s magazines) will gain a comfortable space on my bookshelves. It grew out of a love for vintage cookery books with their recipes for exotic delights such as jellied tongue and seed cake. I am particularly fond of those Christian journals, aimed mainly at women, which were bound into volumes and designed to be read of an afternoon to one’s daughters as they gathered around the fire with their sewing and their paper dolls. Such wisdom is contained within the pages of these books, along with a good degree (to our eyes) of oddity and strangeness. They make for very entertaining and informative reading. I came across the following little essay in a book from 1905: ‘A Healthy Home and How To Keep It’ by Florence Stacpoole. I am not sure if she was a ‘Mrs’ or an earnest spinster but she certainly comes across as a formidable lady. She seems to have had a crusade to promote good ventilation in rooms. A worthy venture indeed. Truly there is much good sense in her book (along with a few tips that would, I think, land one in the Emergency Room). Here are her thoughts on thrift. I particularly like her definition: True thrift consists in getting the best value for our money, and wasting nothing. Thrift, or How to Save Money and have Comfort at Home. "Muddle at home makes husbands roam." What is the meaning of "Thrift"? Is it, as some people think, living cheaply in order to hoard? By no means. The word comes from a word in the Icelandic language, signifying to thrive. To practice thrift, therefore, is to do what will cause you to thrive. I need not explain what that means, as we all understand it. Mere hoarding of money does not cause thriving. People have died of starvation because they would not spend on food the money they were hoarding. That is not thrift. It is miserliness. There is a great difference between the two. True thrift consists in getting the best value for our money, and wasting nothing. An old Quaker once said to his son, "It’s what thee’ll spend, my son, not what thee’ll make, which will decide whether thee’st to be rich or not." Isn’t this true ? I heard lately of an old woman saying a curious thing. She had noticed that well-off people are often very careful about spending money, and that poor people are sometimes very careless about using up odds and ends which could be turned to advantage, so someone overheard her saying, " If the poor was as saving as the rich there wouldn’t be no poor!" I have often thought of her words, when I have seen, as I am sorry to say one sometimes sees in London streets, a little heap of good pieces of bread lying in the gutter, thrown there by someone too careless to trouble to use it.
" Gather up the fragments, that nothing be lost," was a distinct command of our Lord’s. I think people often forget that wasting even bread-crusts, is disobeying one of our Lord Jesus’s special injunctions. In a very good cookery book I read these words, "Probably the contents of the dust-bins of England, would more than fill the soup-tureens of France!" I am afraid this is too true, and that into our dust-bins we often throw what our more thrifty French neighbours would turn into good nourishing food. I am going to mention presently some ways of using broken bread and other things often thrown away, but first I want to say that thrift does not always mean buying the cheapest thing to be got. Sometimes the cheapest things are the dearest in the end. Take the matter of house rent, for instance. If you have a family and if you can afford to pay for two rooms, it is no real thrift only to hire one room and all live in it, and put the rent of the other room into the Savings Bank. Why? Because you are certain not to be so healthy if you all live in one room. If you lose your health you lose your work, if you have to go to Hospital you can’t earn. The saving of a few shillings in rent will be very soon lost, and a great deal more with it, by the losses and expenses that always go with bad health. Again, if you have enough money for wholesome food, it is no thrift to buy the cheapest and worst kind which will not properly nourish the body. Anything that defrauds the body of what will keep it strong and in good condition is indeed a thriftless thrift. I know there are some people who think it, is quite extravagant to buy eggs. They would think they spent too much if they had two eggs for breakfast-but they think nothing of drinking a pint of beer for luncheon and dinner. Now in two eggs there is about eighty times more nourishment than in a pint of beer! Again, if you have money to buy a good strong pair of boots, it is no true thrift to buy a cheap flimsy pair for half the price good ones would cost, and put the rest of the money in the Savings Bank. Wet feet cause many an illness, and your cheap boots will be very dear ones indeed if they lead to pneumonia, or rheumatic fever. We must distinguish between real thrift and false thrift if we would get the best value for our money. 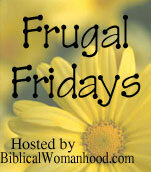 Visit Crystal's blog Biblical Womanhood to be inspired by other Frugal Friday posts. I love old vintage homemaking books, too. Thanks so much for sharing that essay!